When all you need is a basic understanding of the anatomy of the muscular system, supplemented by current evidence and research, Cram Session in Functional Anatomy: A Handbook for Students & Clinicians is what you will look to for quick, at-your-fingertips facts. Cram Session in Functional Anatomy by Drs. Benjamin, Bechtel, and Conroy is a concise and illustrated quick reference that takes over 60 years of combined clinical experience to provide an understanding of the muscular system and its relation to the fascial and ligamentous systems in the human body, providing benefits for improved patient care and streamlined exercise prescription. What is in your Cram Session? 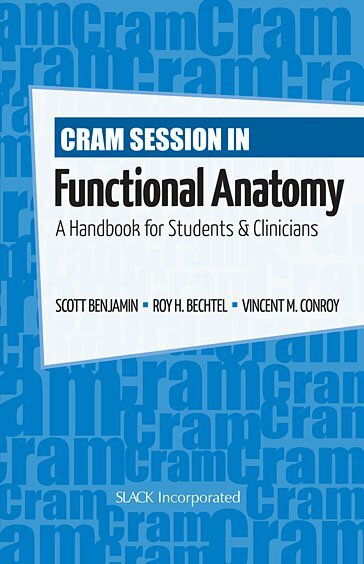 Cram Session in Functional Anatomy: A Handbook for Students & Clinicians is a practical, easy-to-read handbook for all students and clinicians involved in physical therapy, athletic training, occupational therapy, and other rehabilitation professions. Chapter 6: The Forearm and Hand Muscles: What Is Their Role? Scott Benjamin, PT, DScPT, received his undergraduate training from the Michigan Technological University in 1982 and his BS in Physical Therapy degree from the University of Illinois at Chicago in 1989. His graduate work was completed at the University of Maryland and he is the coauthor, with Dr. Bechtel, of one of the first texts on rehabilitation after artificial disc replacement in the country. He has authored papers on total disc arthroplasty, lateral epicondylitis, clinical modalities, isokinetic testing, and aquatic therapy. Scott teaches continuing education courses nation¬ally with Dr. Bechtel. His areas of interest are biomechanics of the spine and sacroiliac joint, manual therapy, and rehabilitation. Roy H. Bechtel, PT, PhD, graduated from the University of Maryland with a BS in Physical Therapy in 1979. He received an MS in Physical Therapy from New York University in 1981 and a PhD in Biomechanics from the University of Maryland in 1998. He teaches in the Department of Physical Therapy and Rehabilitation Science in the School of Medicine at the University of Maryland in Baltimore, and has conducted continuing education courses nationally and internationally. His research interests are in manual physical therapy, assessment and treatment of pain of spinal ori¬gin, and biomechanical modeling of forces applied to spine and sacroiliac joints. Recently, Dr. Bechtel published a paper on the tolerance for isokinetic testing pre- and post-lumbar fusion. He is the coauthor, with Dr. Benjamin, of a book on postsurgical rehabilitation after artificial disc replacement. Vincent M. Conroy, PT, DScPT, is a two-time graduate of the University of Maryland, receiving a BS in Physical Therapy in 1990 and his DScPT with an emphasis on Basic Science in 2005. Dr. Conroy currently holds the rank of Assistant Professor at the University of Maryland School of Medicine, Department of Physical Therapy and Rehabilitation Science (PTRS). His primary duties include instruction of Human Anatomy, Biomechanics, and Musculoskeletal Screening Evaluation and Treatment. He also provides oversight as the Clinical Director of the Department of PTRS’s Service Learning Center (SLC). The SLC provides pro-bono physical therapy intervention to individuals who do not have the benefit of health insurance. Dr. Conroy has lectured both regionally and nationally on topics related to the SLC and clinical anatomical reasoning.